Happy long weekend, my wonderful friends! I hope you had a Blessed Thanksgiving with your loved ones. 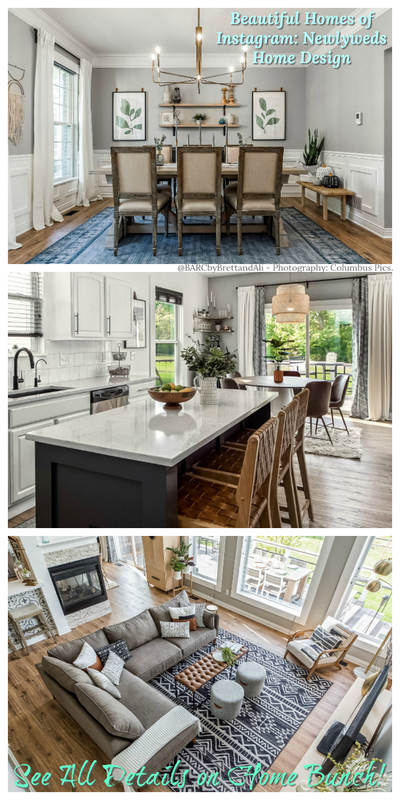 Before I start talking about this beautiful modern farmhouse house tour, I need to thank you all for believing in me and for your trust. I am blogging for almost ten years and this wouldn’t be possible if I didn’t have your REAL and LOYAL support. It’s your daily visits and presence that keeps pushing me to improve my posts and give as much information as I’m able to. I know that you come here to dream, to get inspired but also to learn and this is why I don’t believe in just sharing beautiful pictures. That’s something that internet is filled with, right? 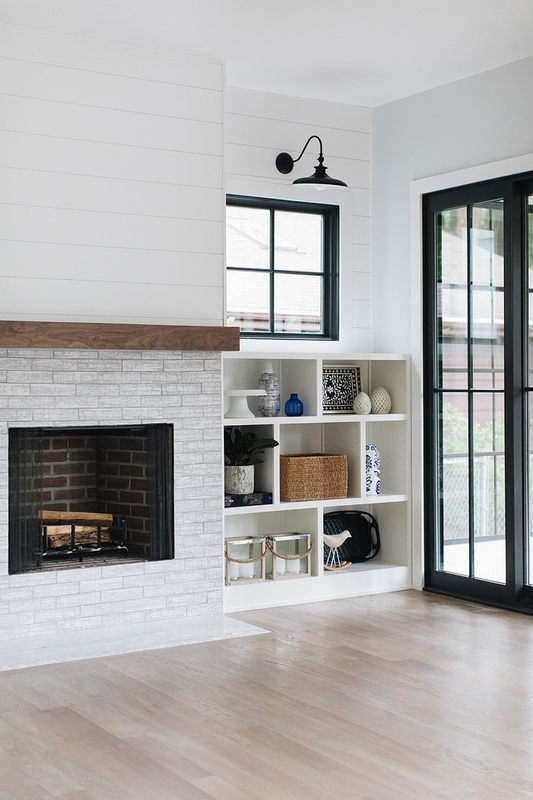 But correct information, coming directly from the professionals involved in each and every house featured, that’s something I am truly happy to be able to offer here. 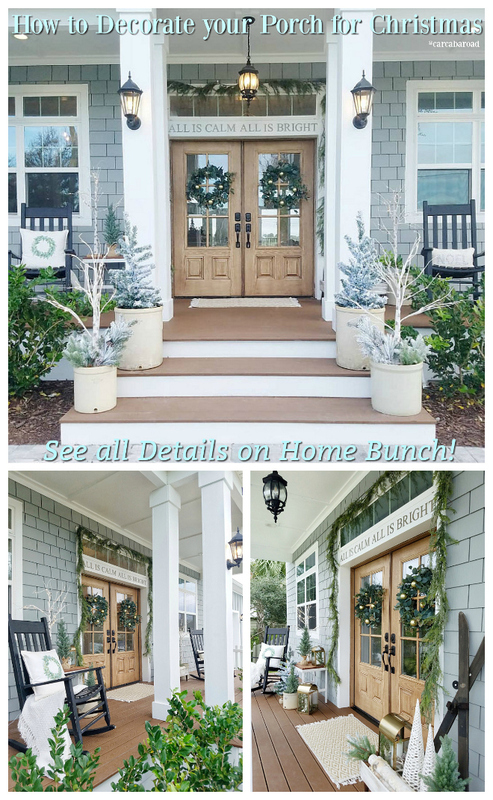 It takes more work and effort from myself and the designers, builders, architects featured on Home Bunch, but we know that you want and deserve to know more. This is my way to honor your presence every day, with every feature. 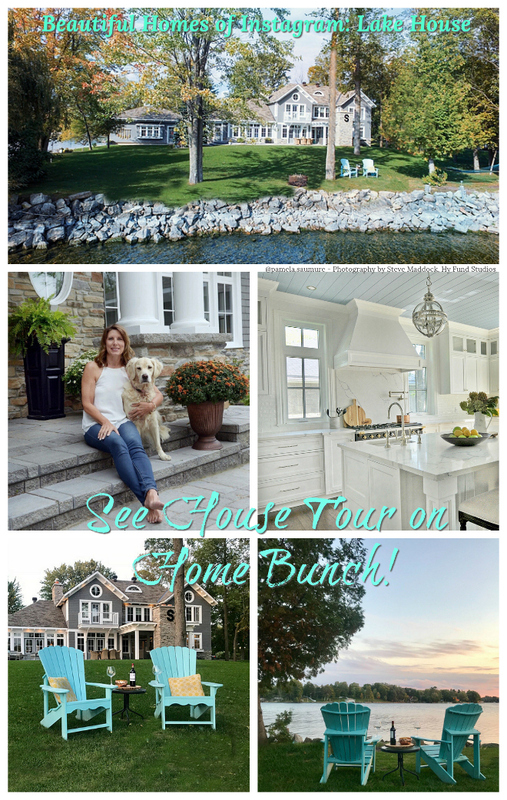 Now, let’s talk about this home?! 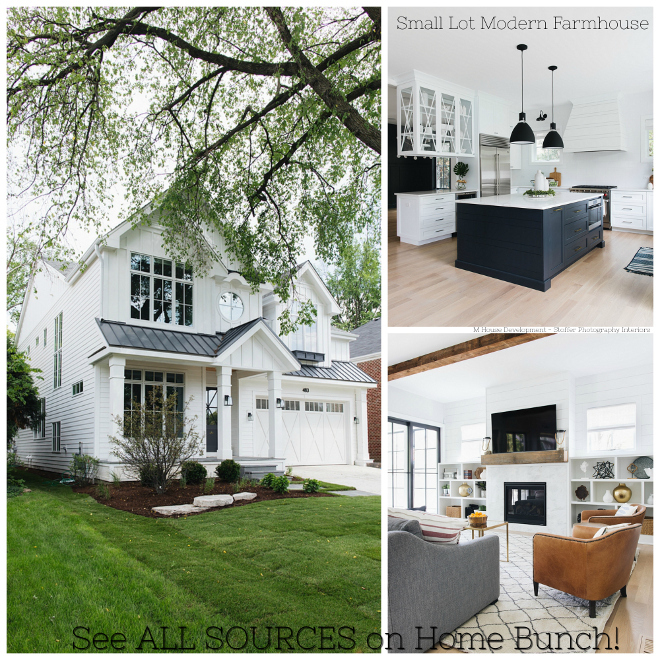 This modern farmhouse is located in Naperville, IL and it was recently built by M House Development – you might remember seeing a post of a home they built on small lot I shared last month. That post became one of the most popular posts of the year so make sure to take a look if you have an extra minute. Although not completely furnished, I feel this 3,000 sf. 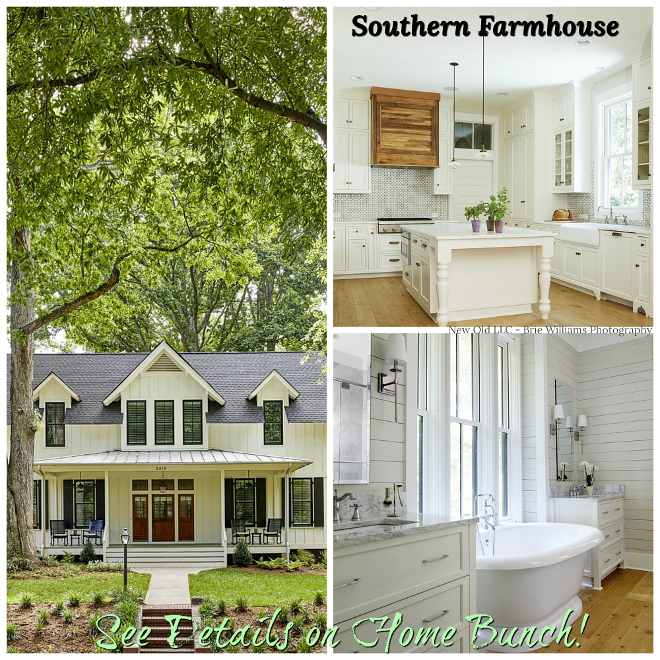 home can really inspire if you’re planning on building or renovating your dream home. 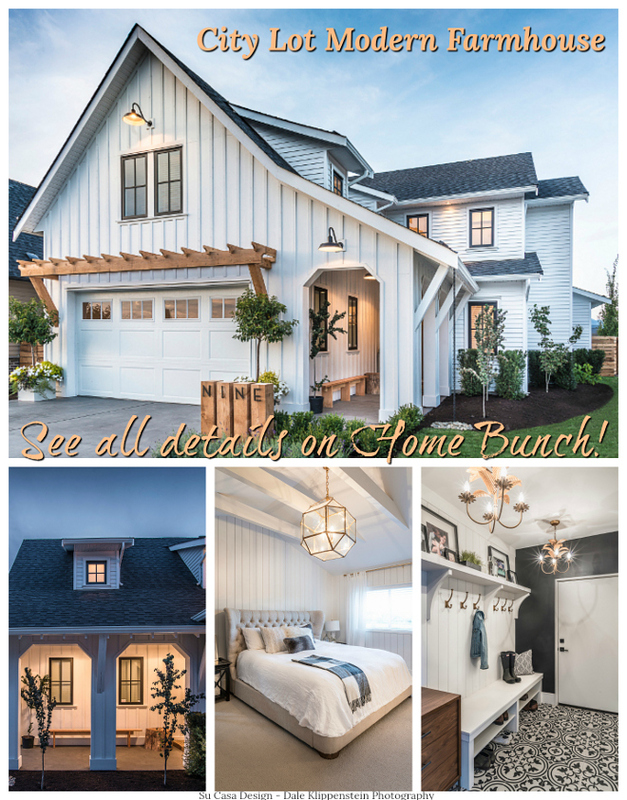 Feel free to pin your favorite interior pictures! 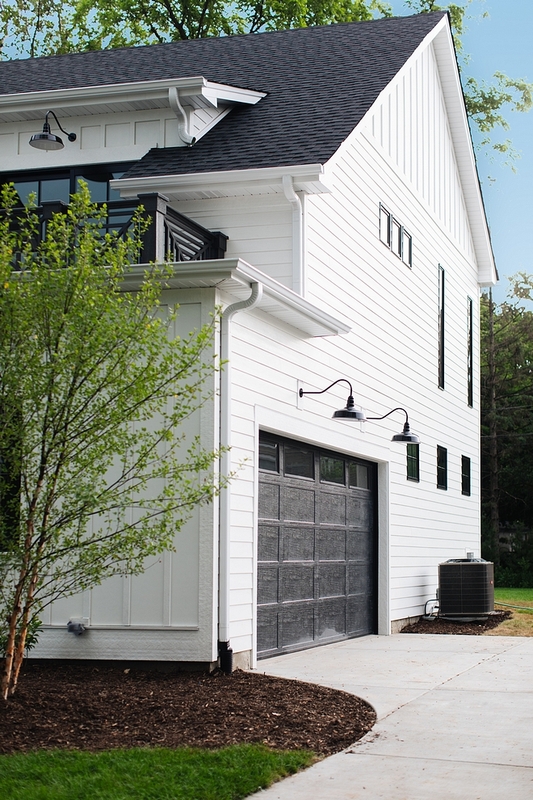 The side entry garage (with balcony over it), features a black garage door painted in Sherwin Williams SW 7069 Iron Ore. 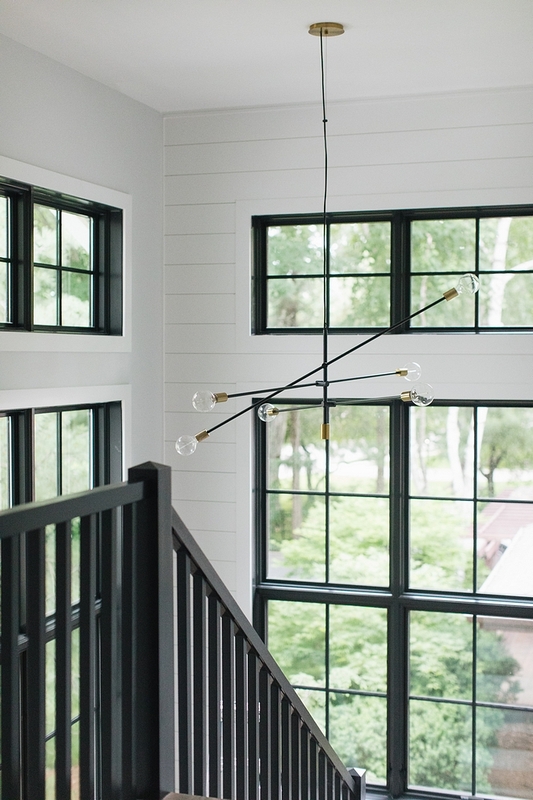 Exterior Gooseneck Lights: Houzz & here in matte. 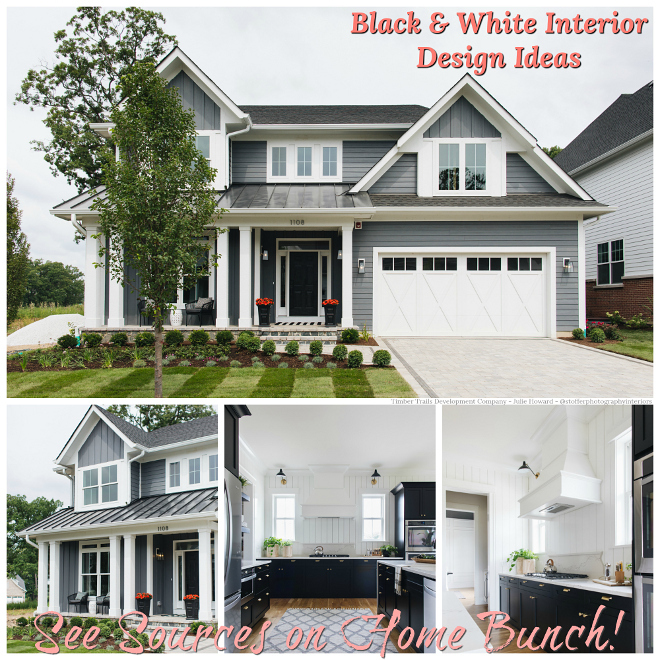 Hello, my dear “black and white modern farmhouse”! Now, how inspiring is this?! 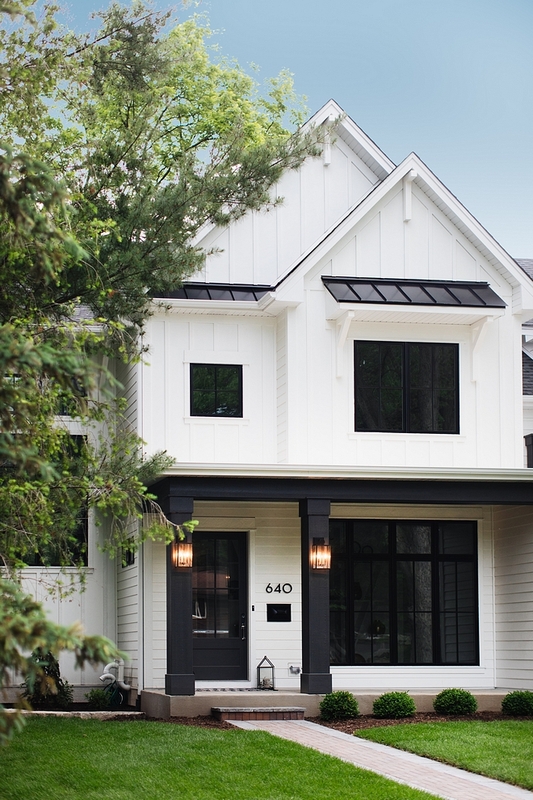 Siding paint color is Farrow and Ball All White. The front door is a Simpson door from the Nantucket series. The model number 77504. Door and porch pillars are painted in Sherwin Williams Iron Ore. Similar Lanterns: Here & Here. 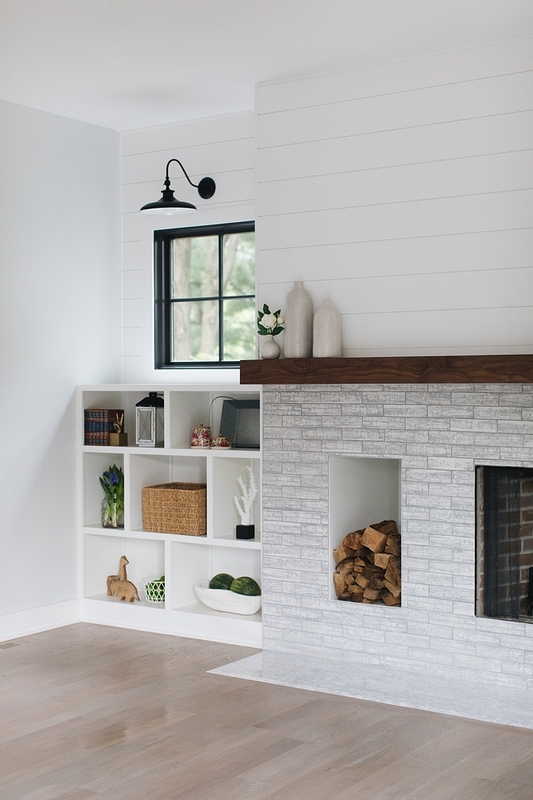 The wall paint color is Site White SW 7070 by Sherwin Williams. 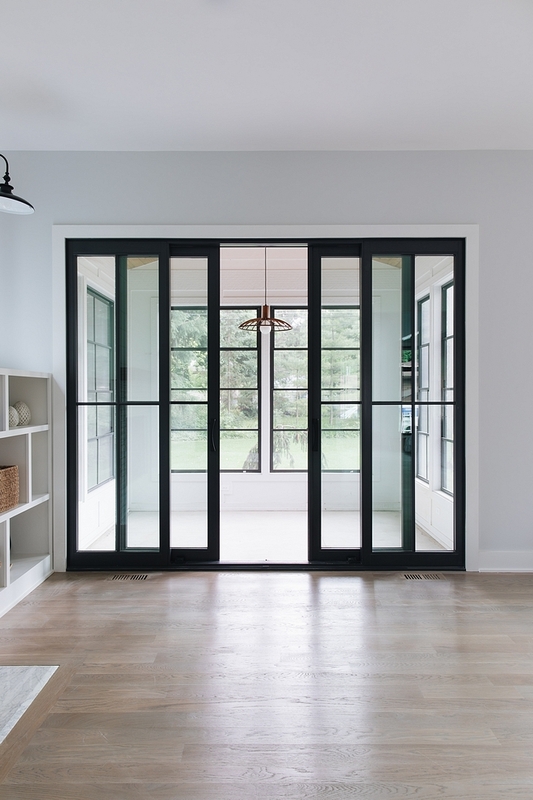 Main floor doors are painted in Iron Ore SW 7069 by Sherwin Williams. Trim paint color is Sherwin Williams SW 7006 Extra White. Similar Lanterns: here, here (in white) & here (in natural). Beautiful Mats: here, here, here, here, here & here. 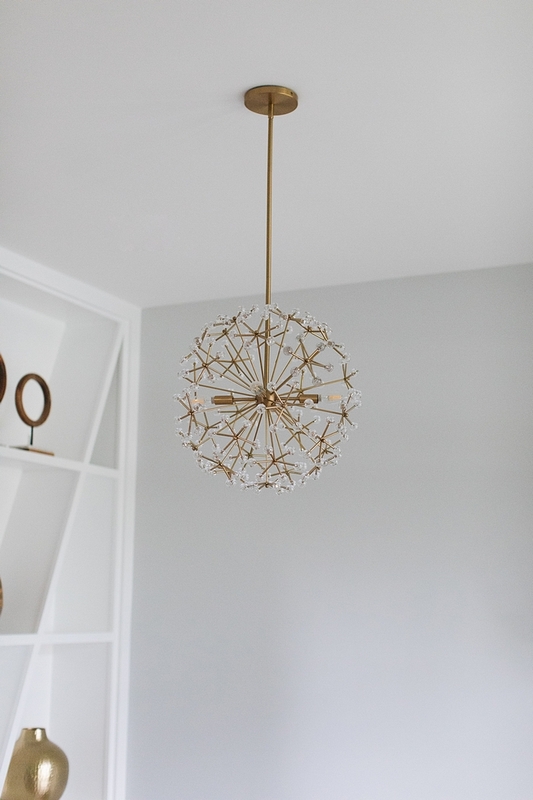 Modern Floral Chandelier: West Elm. This kitchen is extraordinary! It’s really open, bright and uncluttered. I think your mind would always feel relaxed in this space. 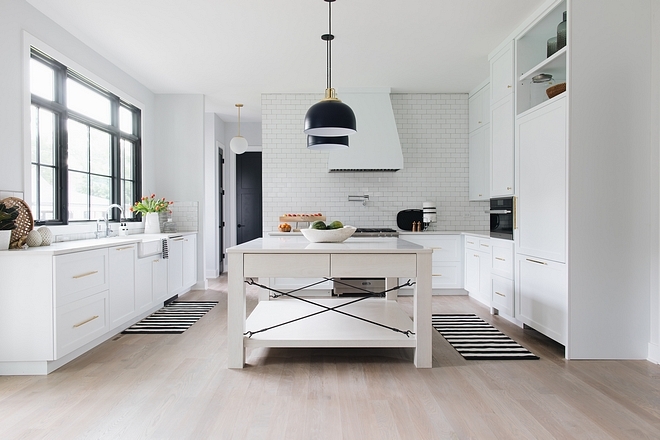 The kitchen features one wall with floor-to-ceiling cabinetry. 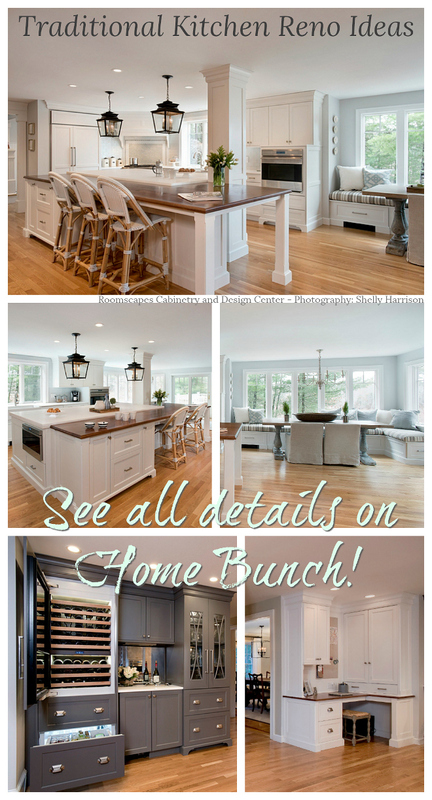 The remaining spaces feature lower cabinets only, which brings an airy feel to the space. 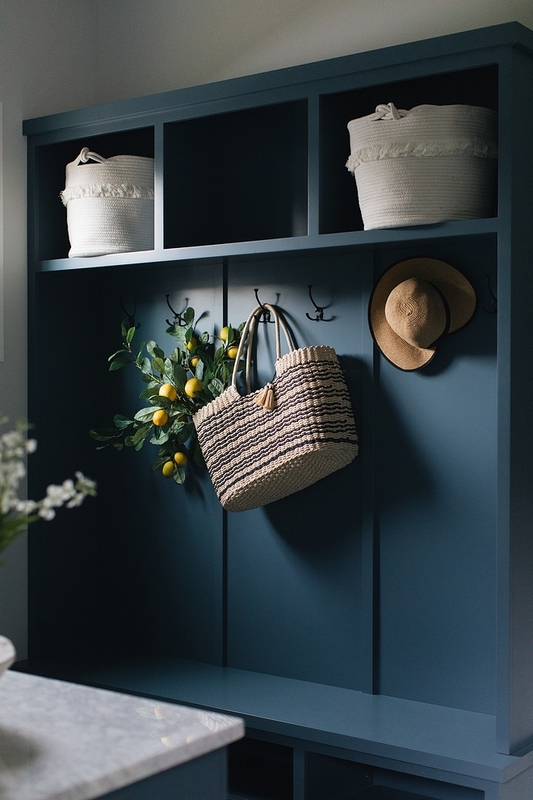 This idea is especially good with you have a walk-in pantry close by. 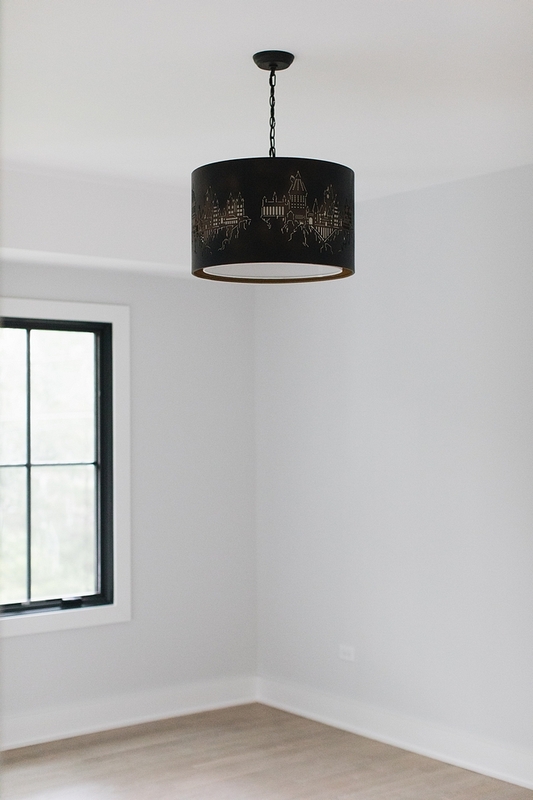 Lighting: Rejuvenation 18″ Dome Pendant. 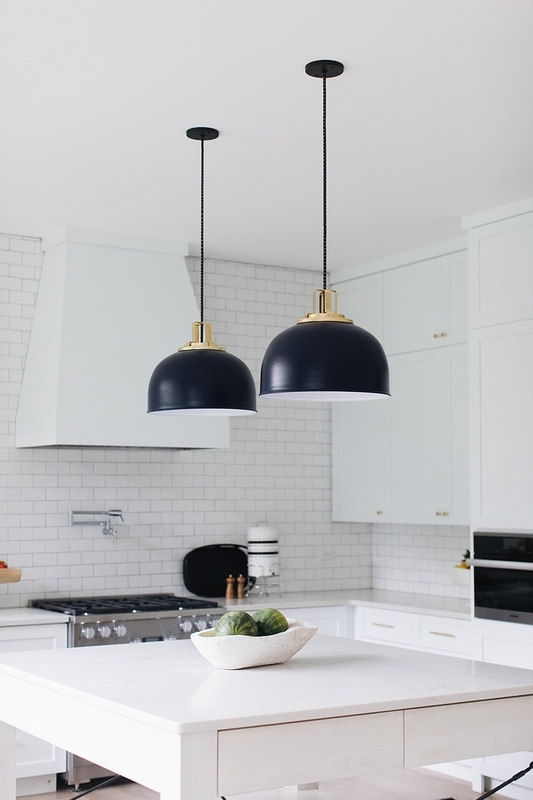 Other Affordable Pendant Lighting: here, here, here, here, here & here. Kitchen Island: Custom white wash stain on the Oak island. Dreamy!!! 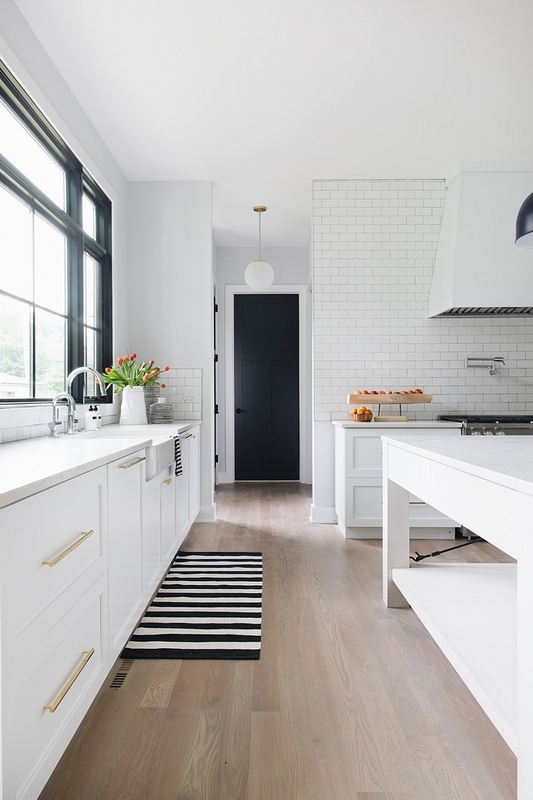 This modern farmhouse kitchen features a classic layout with a new-take on design. The kitchen range is by Miele – similar here. 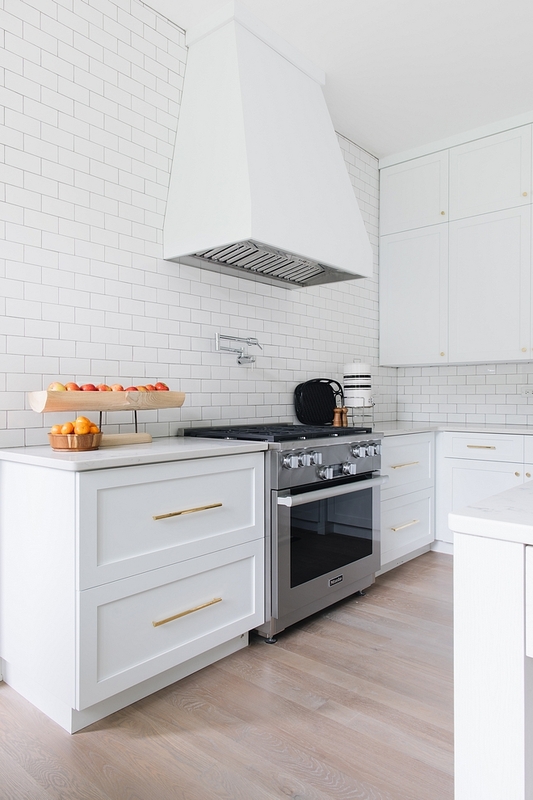 Backsplash is 3×6 white glossy. Being an interior designer and a homeowner I know how expensive it can be to renovate a kitchen. 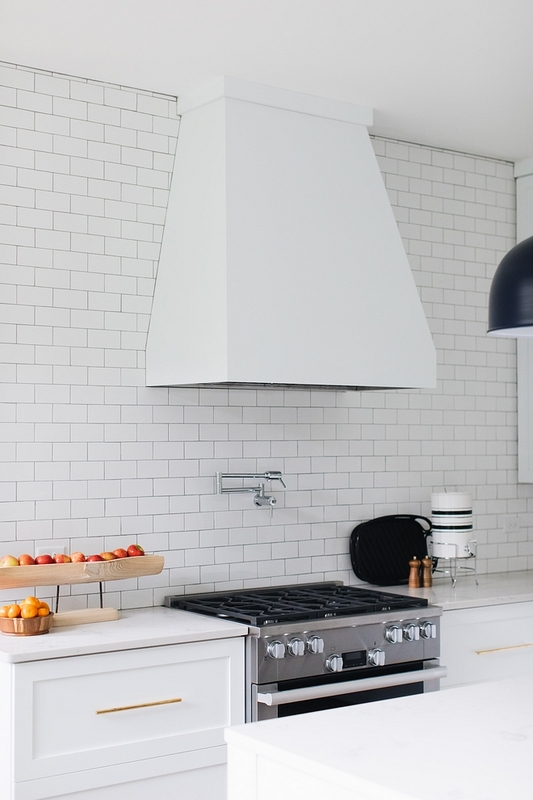 That’s why I often advice my clients to use white subway tile as backsplash. 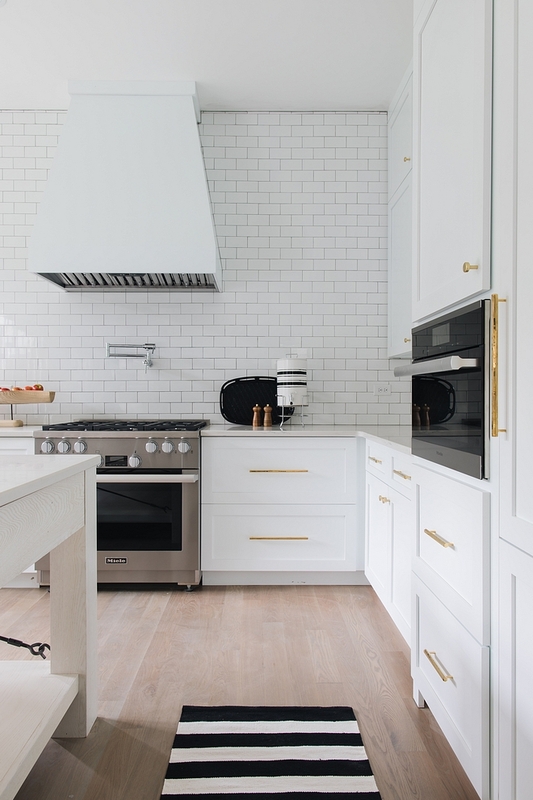 Besides being economical, subway tile is also classic, timeless and a neutral choice. 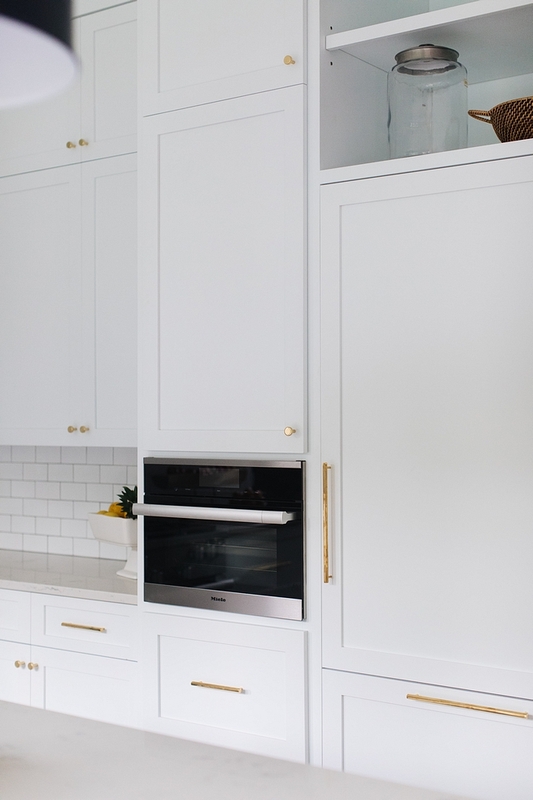 Kitchen Cabinet Details: Maple Shaker-style kitchen cabinet painted in Sherwin Williams Extra White, which is one the crispest whites you can get. 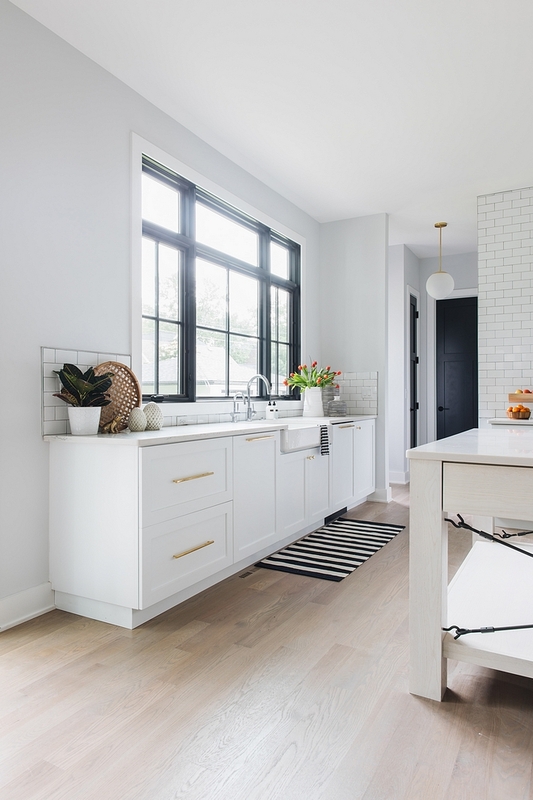 Kitchen countertop is Carrara Grigio. Paint color is Sherwin Williams Site White SW 7070. 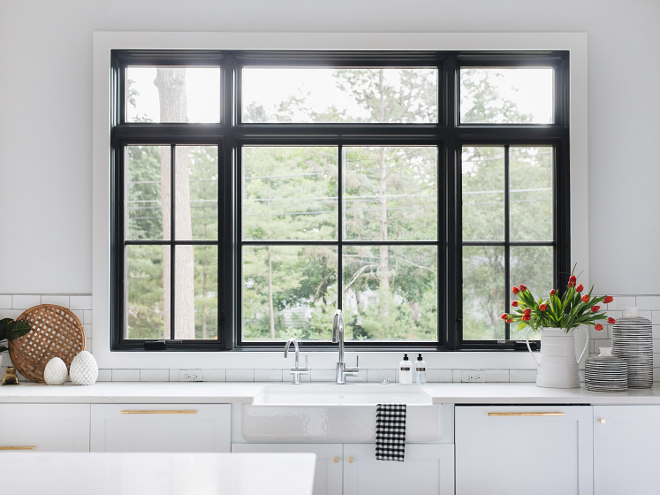 On this side of the kitchen you will find only lower cabinets and a large window above the kitchen sink. 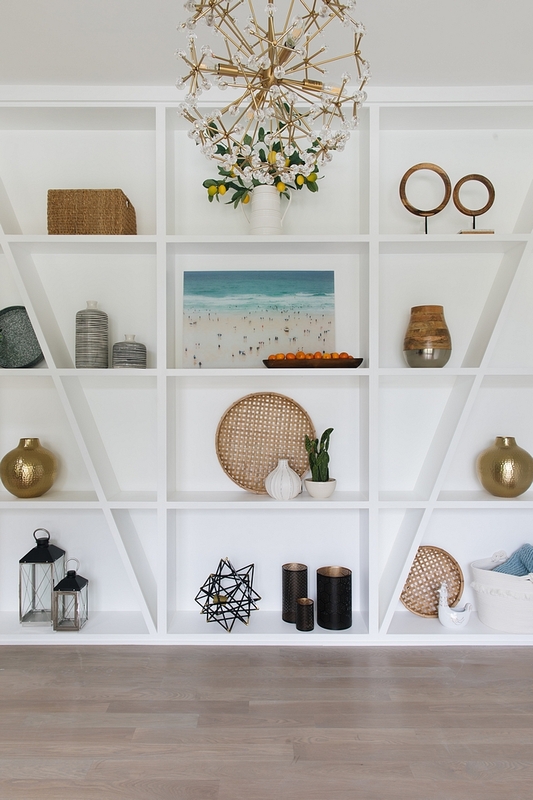 You could add floating shelves, but honestly speaking I prefer this clean and airy look. Kitchen Faucet: Grohe Concetto Kitchen faucet. Paneled dishwashers flank the kitchen sink. 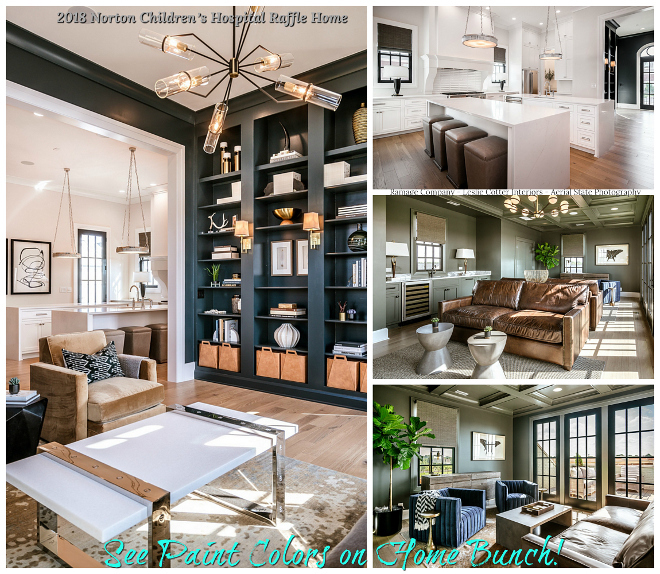 The kitchen opens to a beautiful family room. 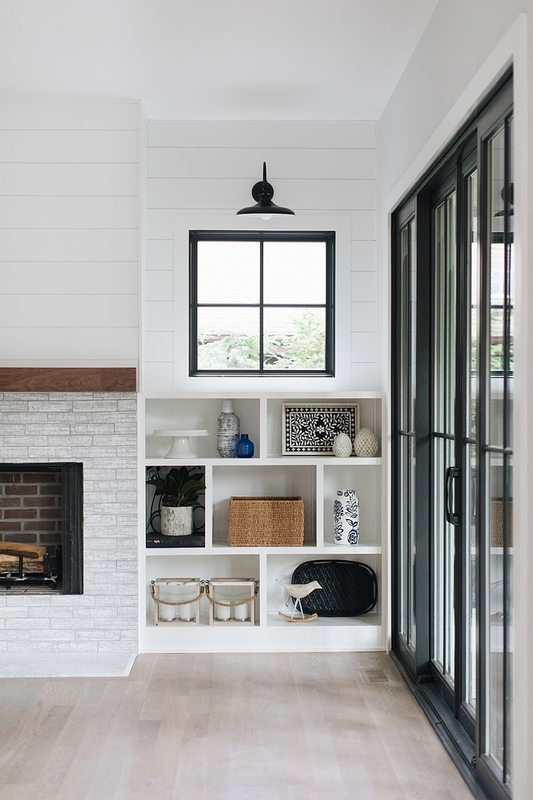 This modern farmhouse fireplace features a brick-style tile and a dedicated wood storage space. Mantel is made of Walnut. 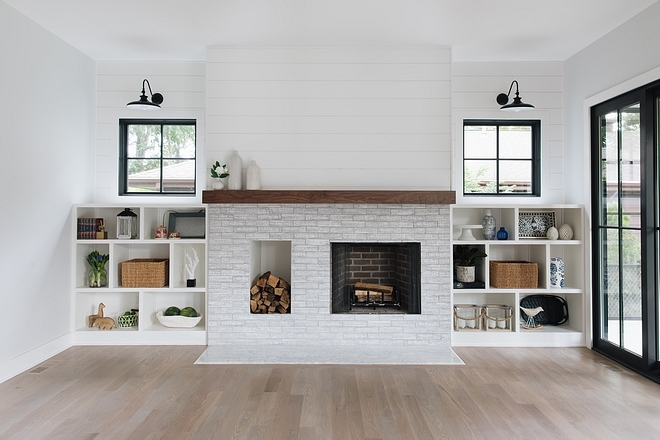 Similar Tile: here & here (matte white) – Other Beautiful Fireplace Tiling Ideas: here, here, here & here. 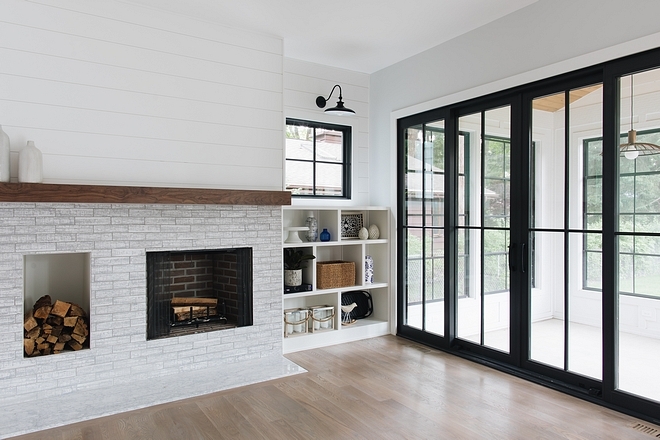 The fireplace is flanked by asymmetrical built-ins with windows and shiplap above. 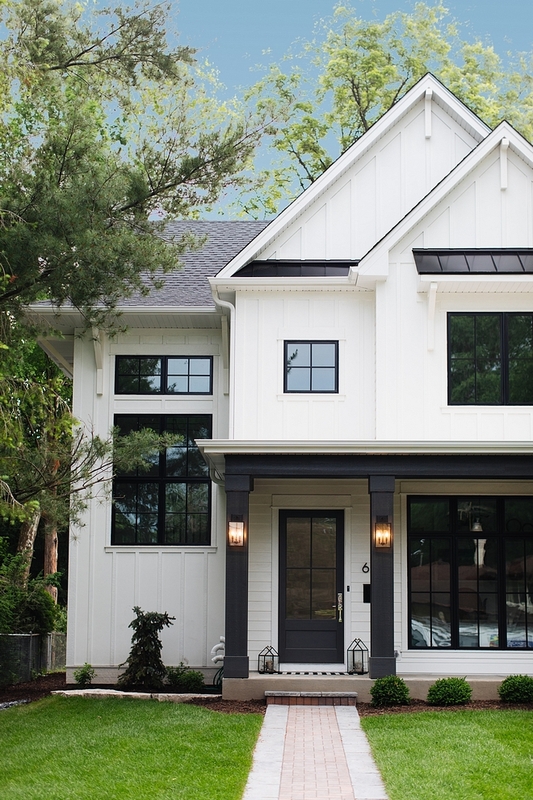 Black windows are painted in Sherwin Williams SW 7069 Iron Ore. 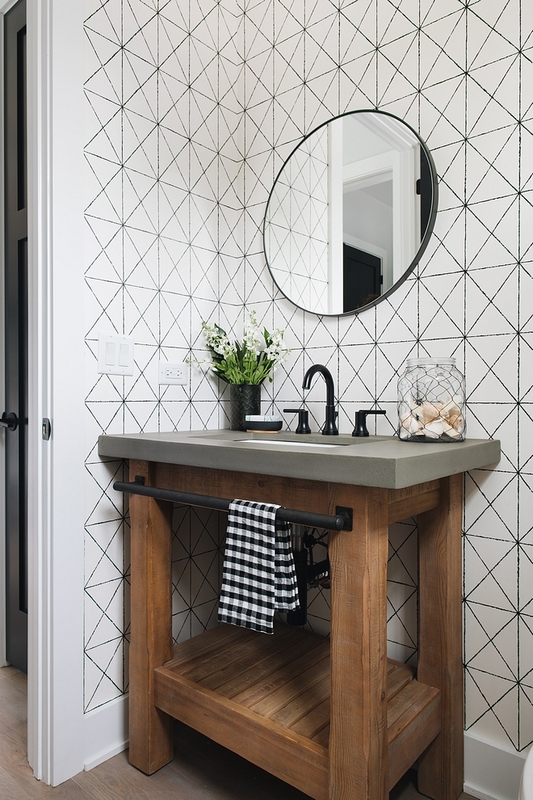 This chunky wood vanity with concrete countertop brings a rustic feel to this monochromatic powder room. Wallpaper: Here – Other great wallpaper sources (I often recommend to my own clients): here & here. Faucet: Delta Trinsic Two handle lavatory. 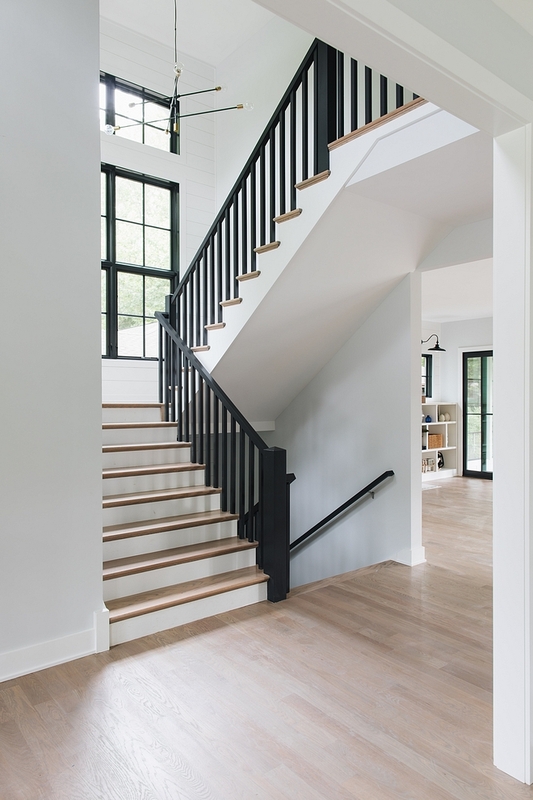 The staircase features black spindles and railings to match the black windows. 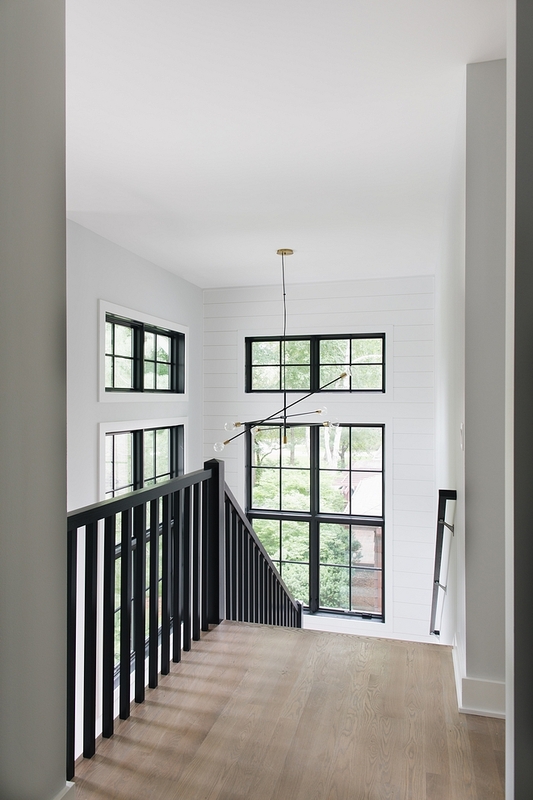 The combination of black railings, black windows, a modern black and brass chandelier with white shiplap really brings this entire space to the next level. 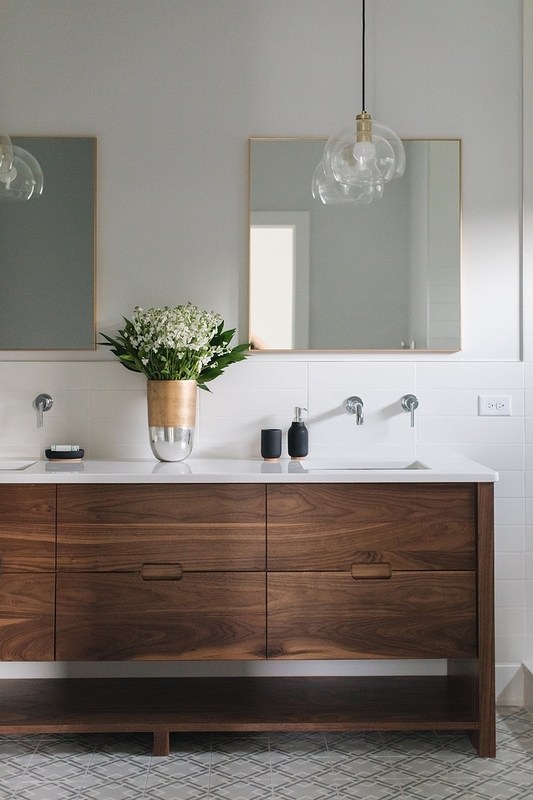 Impressive, dramatic yet neutral. 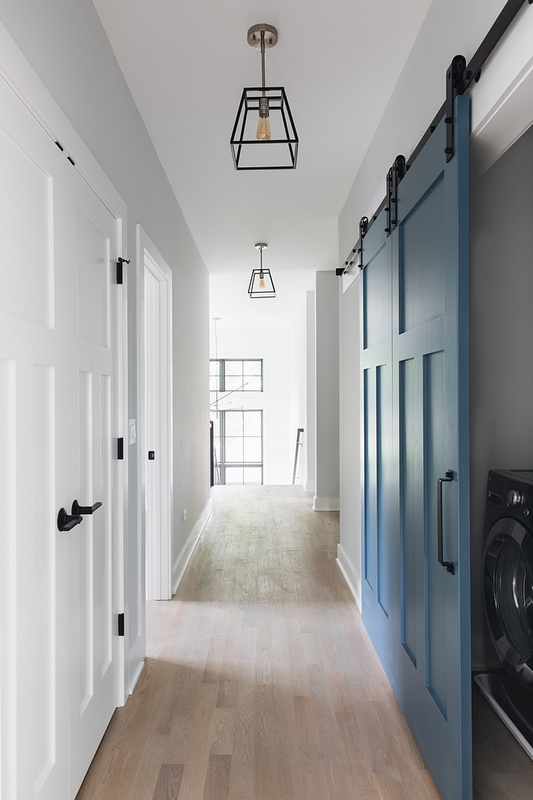 Second floor doors are painted in Sherwin Williams Extra White SW 7006 – except the barn door. Walls are Sherwin Williams SW 7070. 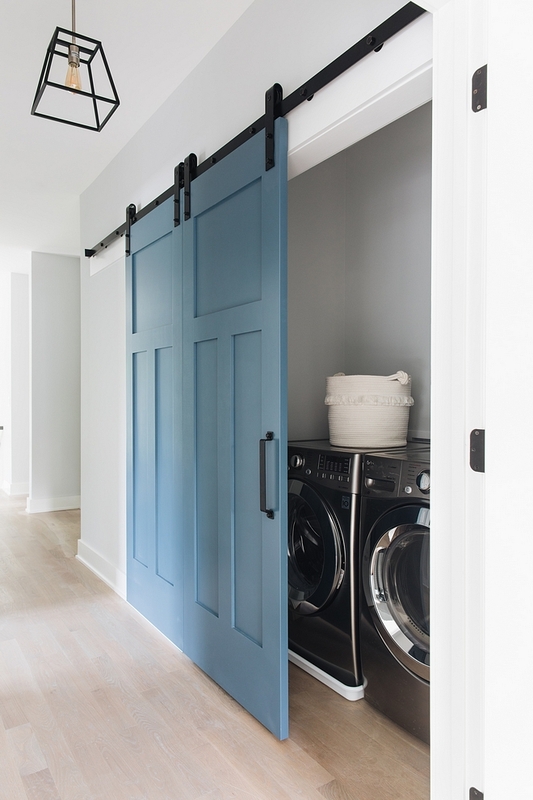 Blue Barn Door Paint Color: Benjamin Moore 838 Denim Wash. 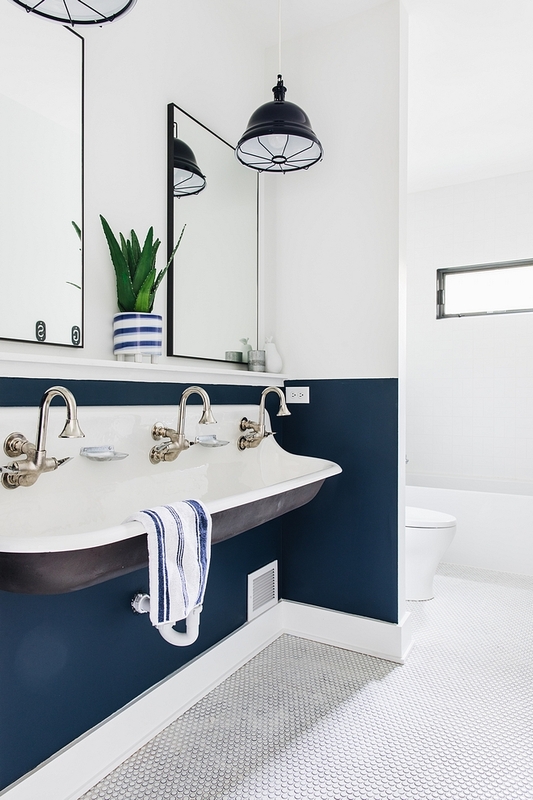 Paint Color: Benjamin Moore Hudson Bay 1680 bottom of wall and Sherwin Williams Extra White SW7006 – This is a great way to add personality in a bathroom while saving money! 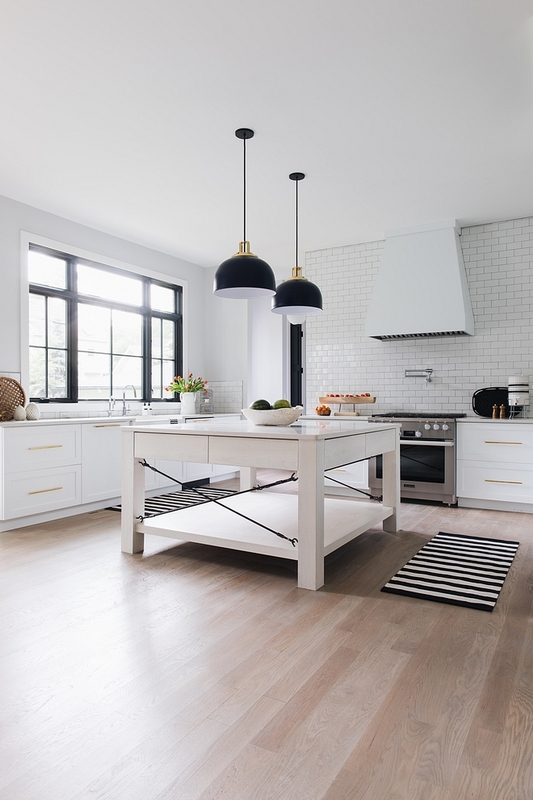 Flooring: Rimmed penny rounds vintage white ceramic. Paint Color: Benjamin Moore Cloud Cover 855. 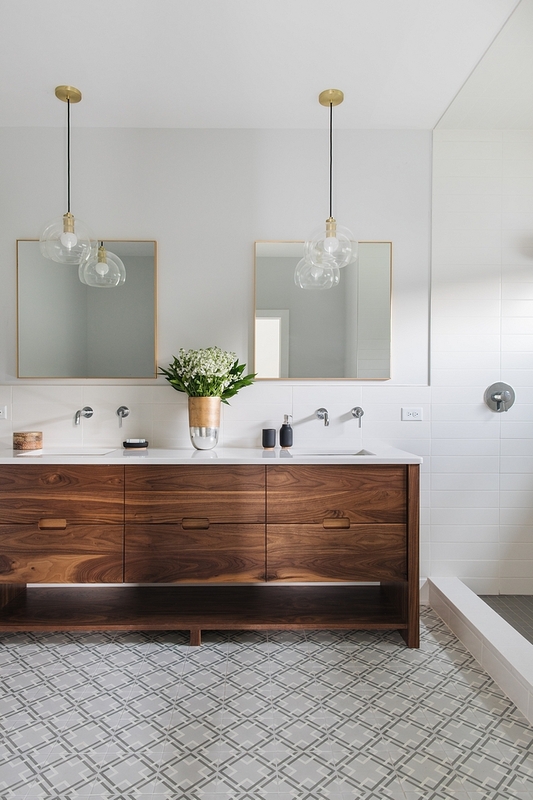 The master bathroom features a stunning custom vanity, geometric floor tile and plenty of personality. 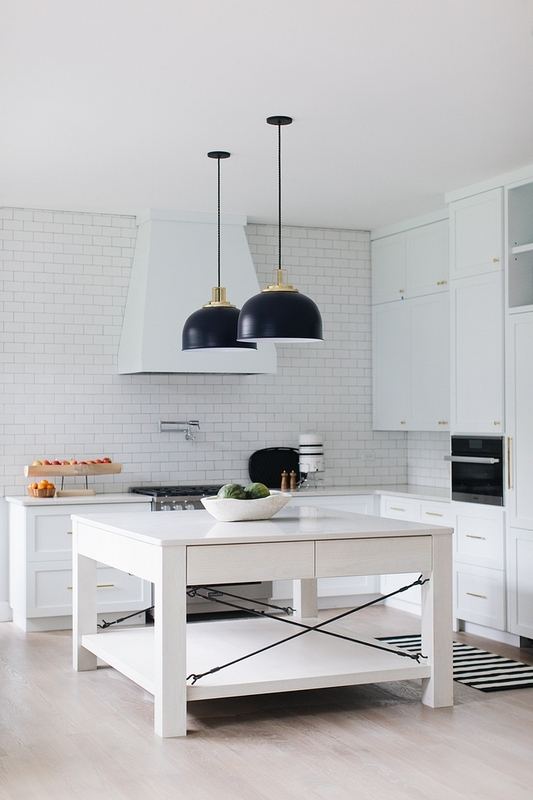 Lighting: CB2 Double Glass Pendant Light. 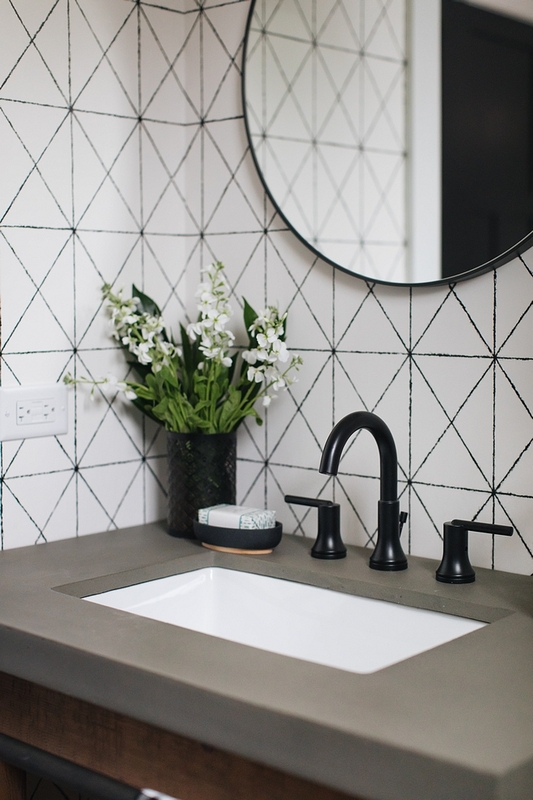 Bathroom wall tile is 4×16 white matte (above vanity & shower walls). 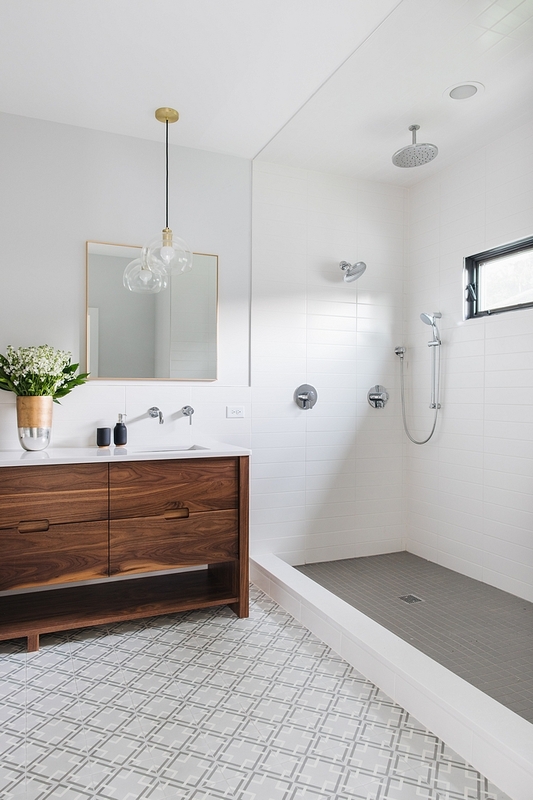 Shower Floor Tile: Mosaic 2×2 matte tile. 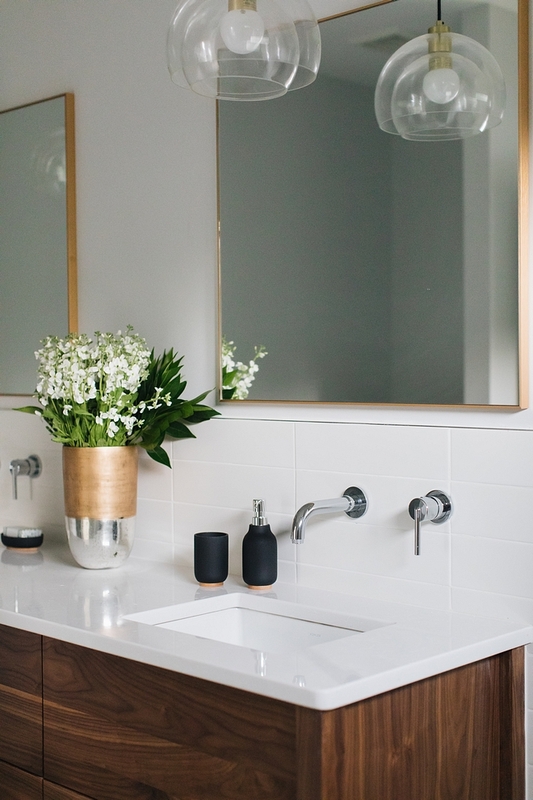 Faucet is Delta Trinsic wall-mount lavatory faucet and countertop is white quartz; Perla White Quartz. 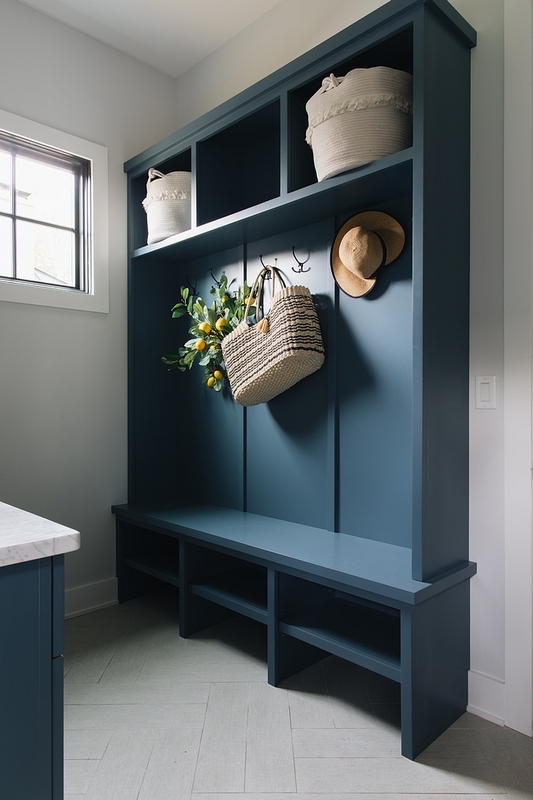 This mudroom is a dream! 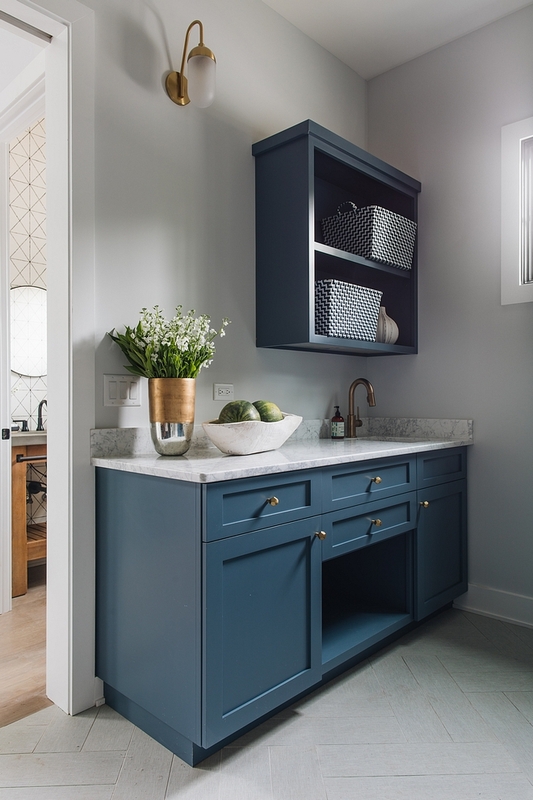 I love the pop of color these cabinets give to the space. 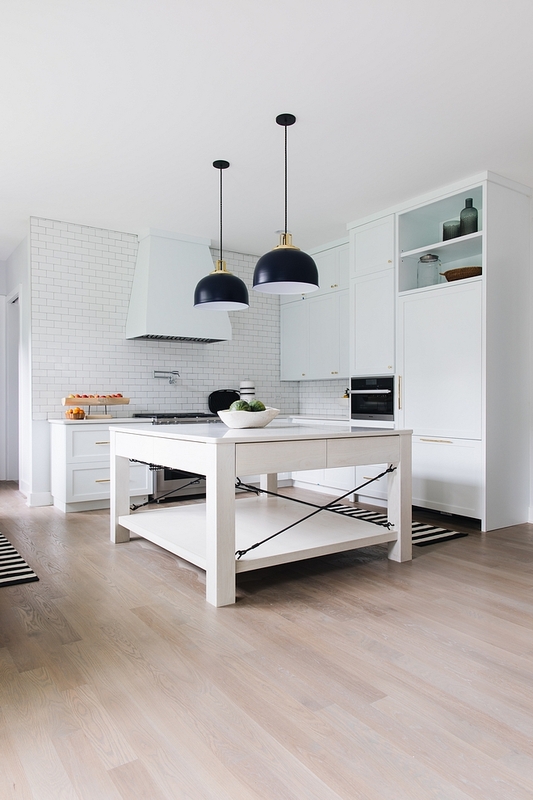 Flooring: Rectified matte 6×24 in herringbone pattern – similar here. 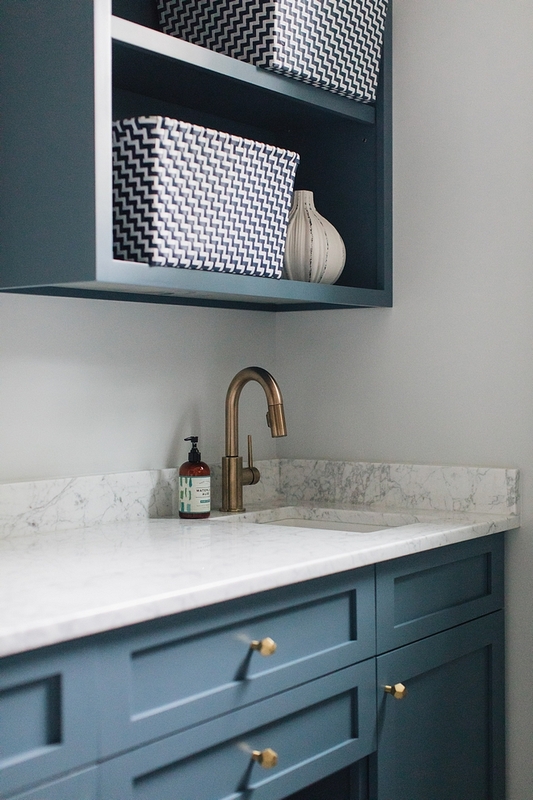 Having a sink in a mudroom is so helpful! It makes easier to clean shoes and cleaning tasks in general. 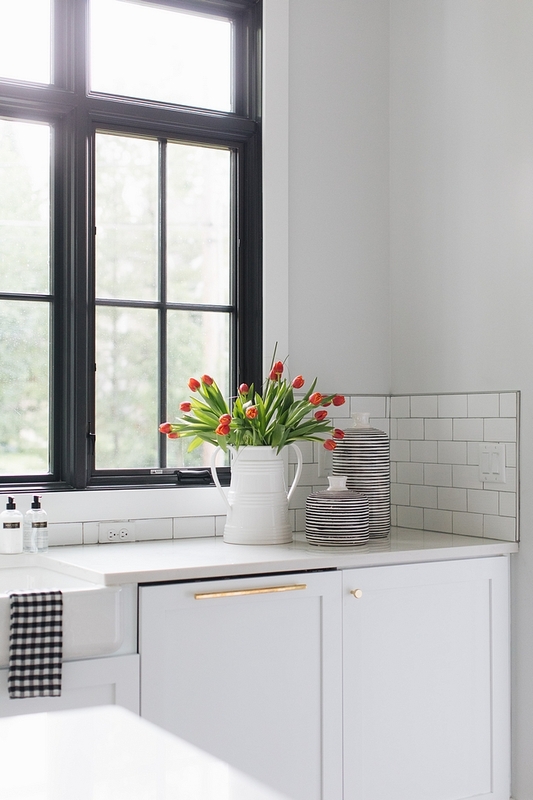 Mudroom countertop is White Carrara. 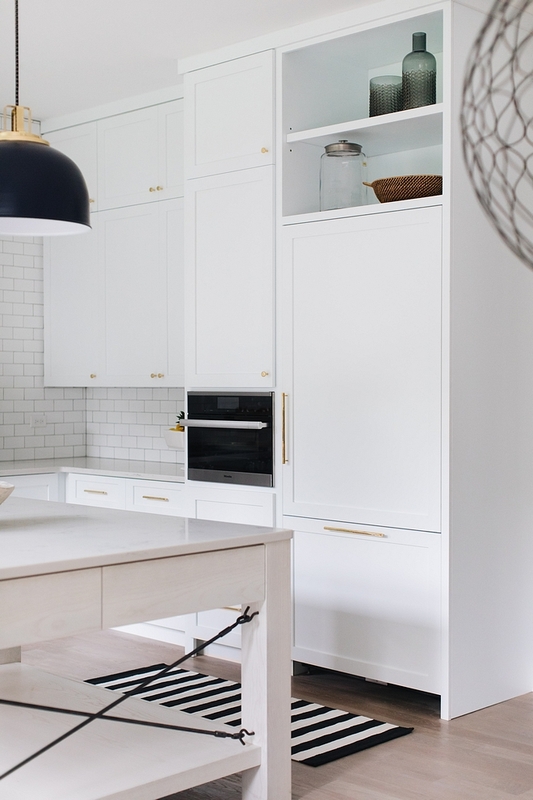 The cabinet paint color is Hudson Bay 1680 by Benjamin Moore. Isn’t it just beautiful?! 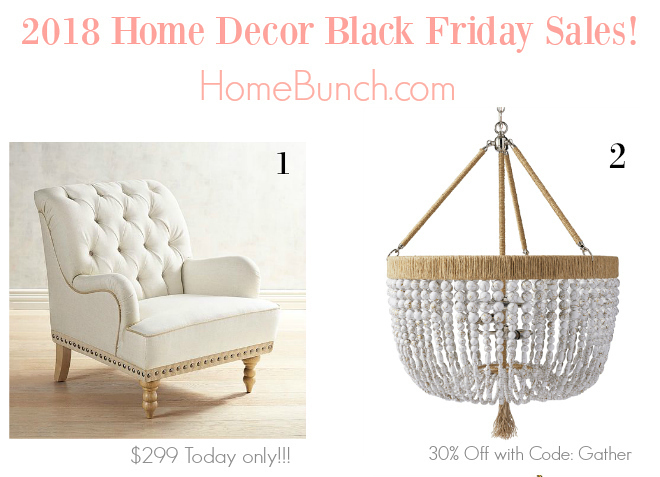 Walmart: Huge Black Friday Sale on Furniture, Decor & Electronics! 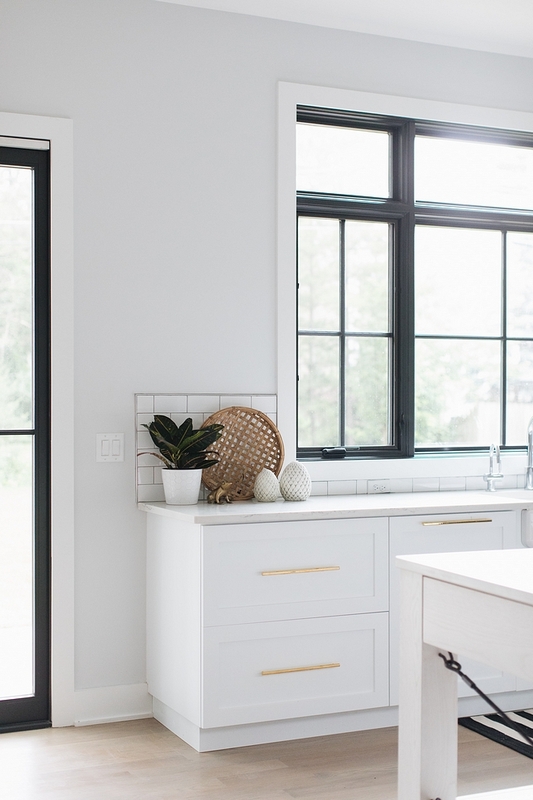 Build: Save Up to 85% Off on Kitchen, Bathroom, Hardware & Lighting! Neiman Marcus: Today Only: Up to 60% Off – Take 33% off selected sale Items!